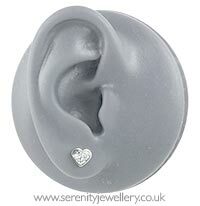 Studex Sensitive hypoallergenic surgical steel 6.5mm wide heart stud earrings with resin covered glitter centres. These earrings come with surgical steel butterfly backs. My daughter wears these earrings everyday for school! They are pretty but best of all because they are flat to her ears and don’t stand out she doesn’t have to tape them up for PE! Great buy! Bought these earrings for my brothers wedding, everyone commented how pretty they looked. Very comfortable. Really sparkly and pretty, daughter loves them. 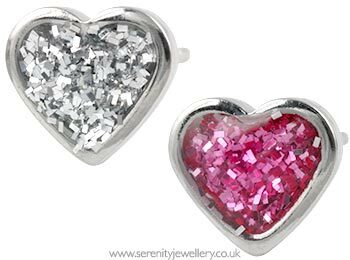 Lovely earrings - am very allergic to nickel so was thrilled to find serenity website with such a choice of hypoallergenic earrings. This will be my go to place for all my earrings now! These earrings are really pretty, my 6 year old loved them. I live in Australia but order from here as I originally struggled to find surgical steel sleepers anywhere, but this site had them - and so I looked at/ordered the studs while I was at it . Great communication and delivery time was good considering the distance !